There are at least 3 other possibilities regularly reported to be under serious consideration. Judge Sidney Thomas of Montana, Homeland Security Secretary Janet Napolitano, and Michigan Governor Jennifer Granholm. We'll take a quick look at Granholm in this post and try to get to Thomas and Napolitano before Obama makes his pick. She is the Governor of Michigan, currently serving her second 4-year term. She fits Obama's bill in looking for someone from outside the monastic-like life of the appellate judiciary. As Governor she has lived the rough and tumble of politics, fighting for her positions on state law and policy, experiencing the push and pull and compromise of making that law and policy, and necessarily trying to serve the interests of her constituents. I.e., she has been working for "real" people with "real" needs and concerns, not just the names of parties in the title of appellate cases to be decided in a sterile environment, by "neutrally"applying the language of the law, wherever that might lead, with less regard for the consequences for "real" people. Yes, that's why Obama and other politicians, as well as many judicial scholars, would prefer some Justices with more "real world" experience--experience in governance or business or serving actual people as clients (or even professors who study such things--what a crazy idea!). Any list of the great Justices includes a disproportionate number of those who had a good deal of non-judicial experience and, in fact, little or no judicial experience at all. The current Court includes only Justices who were judges. It has no Chief Justice Earl Warren (Governor of California), Justice Sandra Day O'Connor (Arizona State Senator), Justice Hugo Black (U.S. Senator), Justice Thurgood Marshall (civil rights attorney) [but see below], Chief Justice Harlan Fiske Stone or Justice Robert Jackson (U.S Attorney General), Chief Justice Charles Evan Hughes (Governor of New York), or Justice Felix Frankfurter (law professor--had to get that one in), etc., etc. 'Nough said. There are no such Justices on the Court now. That's a big part of the case for Jennifer Granholm. Shortly after law school, she was appointed a federal prosecutor in Michigan. After a few years she was appointed corporation counsel for Wayne County. She was then elected the state's attorney general (and the first woman to hold that position). Four years later, in 2002, she ran for and was elected Governor (also the first woman). She won reelection in 2006 despite her Republican opponent's spending a personal fortune challenging her. Oh, you say, so she's a good politician. And, you may also have read that she was once a beauty queen with Hollywood aspirations. OK, then. Well how about considering this: She graduated from Berkeley Phi Beta Kappa, and then from Harvard law school with honors. (Not too shabby. And pretty good indications that she's pretty bright.) She then clerked for a federal appeals court judge--just about the most prestigious position a law graduate can win. It also means that she's seen how an appellate court operates and decides cases. That is, she knows what appellate courts really do and how they really make case law. 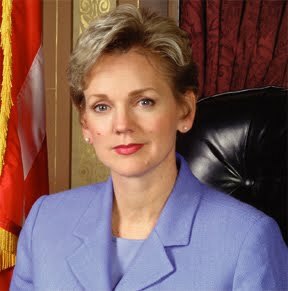 In short, Jennifer Granholm has the legal and political background--and proven skills--to commend her to President Obama, as well as to Senators who would prefer a non-judge as the next Justice. She also has the political ties to Obama such that, with all the rest that she has to commend her, he can't help but consider her. She is also white and a Midwesterner--i.e., not a minority (who Obama typically favors--so the refrain goes) and not another Northeasterner. She is, however, Roman Catholic. Her appointment would mean 7 Catholics on the Court, 2 Jews, no Protestants. Do not dismiss the political weight of that consideration. It's a political drawback. Whether it's spoken or tacit, it will deeply bother some Senators and their constituents. Some other possible drawbacks for Granholm: as a Governor in a state which has experienced a declining auto industry, a failing economy, and high unemployment, she has had her hands full with crisis after crisis and with decisions unpopular with her Republican opposition in the state senate. Some of that partisan opposition might well spill over into Republican opposition in the U.S. Senate. Ultimately, unless something unforeseen arises, Granholm would almost certainly be an easy confirmation. That is something else that would commend her to the President. In the next post--unless Obama has already made his pick, and it's not Judge Sidney Thomas--we'll look at that possible nominee.